I checked mine from age 9 (measurements on our wall still) and it said I'd be 5'5" at 18 (I'm 5'7" and have been since about 16) but it could have to do with the fact I put 100lbs as I have no clue how much I weighed. Yah, I wasn't sure about my weight either. I put 110 but it may have been plus or minus 5. Anyway, it's interesting that it was off by a couple. Thanks for checking in! 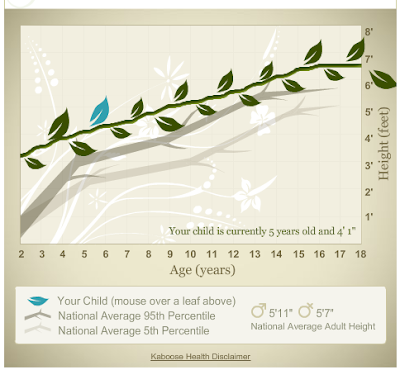 Pretty neat... my daughter should be about 5'7"